A new addition to the “Cloaked” series but with a lighter, cooler palette. That’s a good backlog you’ve been showing. Gorgeous. Full of suggestion and emotional complexity. That loose white paint is brilliant. Thanks so much, Richard. The white paint is the quickest and the most immediate part of this process. Oh how fun to get caught up on what you’ve been doing creatively! 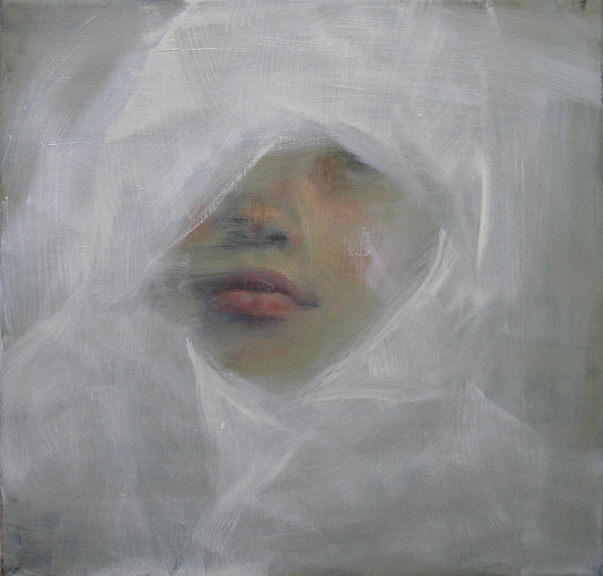 The most recent one is my favorite…”Lightly cloaked.” Just beautiful and so much feeling! Hi Robin! Good of you to take time to visit. So pleased you enjoyed this one. Thank you! I see you have been busy recently. Though I like them all, this one if my favourite. There is something mysterious, or even ghostly, about the portrait that makes it stand out. I’m intrigued by how much you convey about character from a minimum amount of visual information. Mysterious and beautiful. The white just glows. Stunning and serene. I love the ethereal, dreamy, haunting quality of this piece. Disturbing, in a gorgeous way. I hope so;) Thanks very much, John. Thanks so much, Eddie Two Hawks. Mysterious mood. Another great one! I think I should use your pictures when I teach creating a character. THey’re so evocative! You are welcome to them! Thank you, Carol. Oh my this is just exquisite….on so many levels!